Los Osos native Spencer Harris, who is currently studying geology at Northern Arizona University, has applied to be one of the first four humans to inhabit Mars. 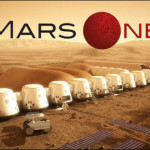 Harris has qualified for the second round of the application process for a human settlement of Mars, known as Mars one. Harris said he has concerns about leaving people behind but is not bothered by the lack of a return flight. Harris must now complete a medical exam and prepare for future rounds of the application process. The third and fourth rounds may take the form of a reality television show to raise money for the trip. Hopefully, they will allow no religion at all on Mars. That way, they can avoid war. Gee, I thought Al and his dog would be the first to raise their hands (paw). If Mr. Harris is successful in this adventure, and he is a pseudo-christian. then we can expect the Hebrew God’s bible and Christianity can be spread upon any future civilization on Mars too! Unfortunately, if the Jews or Muslims get up to Mars, then the needless religious wars can start anew. I doubt that fundamentalists of any type will be accepted for this mission. (Fundamentalist views are rarely held by scientists and I am sure that is one of the criteria for selection.) Therefore, barring a “religious revelation” after launch, I doubt that there will be major conflicts based on religious ideologies among the crew. This is where our (God-given) technological superiority kicks in. Mars can a Christian planet! As “Muhammad” is the top name for boys born in Britain the Muslim conquest of Western civilization is a given. No, when we can’t even read, the superiority feelings are a complex and not anything to be proud of. London not England. This is REALLY big. Making it to the second round is HUGE! Congrats, Spencer! Wow! There were a LOT of applicants, over 200,000, from all over the world! To survive that first round and move into the second, 1,058 candidate, round is ASTONISHING! I’ve been following the Mars One announcement closely, but did not realize we had a local in the second-round pool! (OK, I’m stepping off my nerd-box now). Unless the box is a real box, like made of wood, I do not think you can step off it. I don’t like living under Gibson’s arrogance either, but moving to Mars seems a little extreme. An interesting way to fund our space program, a reality show? Maybe the shows will host other fund generating events, like riding an ancor to the bottom of the sea, sky jumping, Mid-Eastern Real-Estate Broker, etc. If only Adam Hill would apply for this program. This is not NASA or government-run. This is a private, non-profit institution that basically realized NASA (or any government-run space entity) is a joke and not really into space exploration. So they took it upon themselves, and there were LEGIONS who joined the cause. It’s a bold time-table, and quite life-altering for the crews that ultimately will be going, should it all materialize. As a native of Los Osos, Mr. Harris should be well prepared for another planet. Come to think of it, there’s several of his Homies that might make good traveling companions……one way please. When the four arrive on Mars they most likely will form a government and Julie Tacker will be there for “public comment” every time they meet. Very funny Mitch. Thanks for thinking of me. Best of luck to young Spencer. Perhaps you will find water for your hometown. A little late. Adam Hill moved there last week.